Film noir – Film. Politics. Pop Culture. 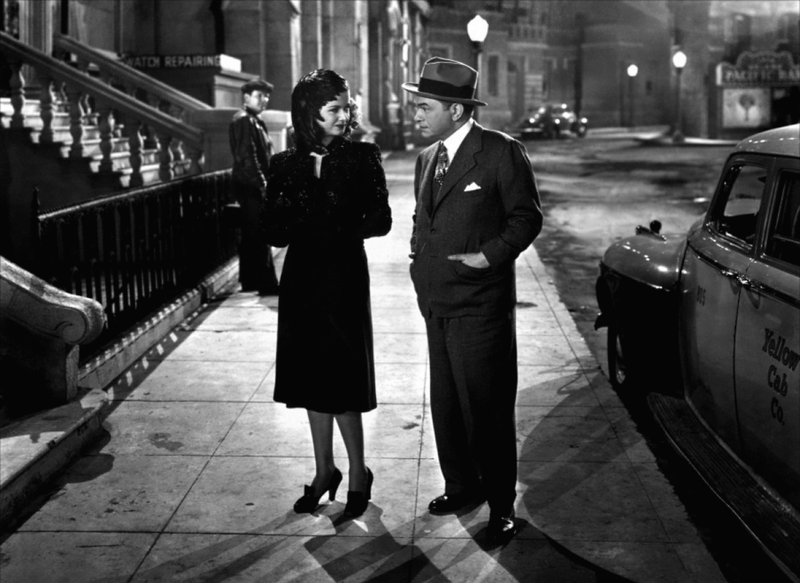 Scarlet Street is a masterful piece of film noir, featuring pulpy characters and two-faced women. The main character, Christopher Cross, played by Edward G. Robinson, leads us assured and clear-eyed through the film’s moral ambiguities. Christopher is put under the spell of ‘Kitty’, a sharp dressed girl he rescues from the shadowy arms of a thief after a drinking party with fellow workers. This leads to Kitty and he going out on the spot at a sulky and suave underground bar and results in Kitty making wild assumptions of Chris’ personal life, thinking in cloudy retrospect that he is a wealthy old man. Fritz Lang molded this film with precision and conspicuous irony, creating a perspective filled with tension and wavering beliefs. He puts us directly in the mind of the murderer without voice-overs or scenes of confession. A typically moral professor, played by Edward G. Robinson, hits rock bottom when he makes an impulsive and frightened response to a raging boyfriend of a woman he befriends; it results in the death of the alpha-lover and the consequences, emotionally and sociologically, that ensue. Proffesor Richard Wanley gets in real trouble after the murder he commits; he is a highly unexpected culprit, and in fact has friends in the police department. When they talk about the case, he becomes jittery and wants to change the subject. But he eventually is taken onto the scene of the crime, where the murderer disposed of the body, and is shown the clues and leads the cops have established, which are entirely against him. The characters are always enticing, especially the motivations of Alice Reed, played by Joan Bennett, who witnessed the crime. The film is an argument against generalizations in crime. In our justice system, we rely partly on the jury to judge the person to the alleged culprit, and like Lumet’s 12 Angry Men shows, it is not always right. The jury would not pick a fatherly-like proffesor like Richard Wanley to be convicted as a murderer; they would pick a young person with lots of energy and less than a reasonable doubt. The film seams together its intricacies with tact and skill.